Sunshine. 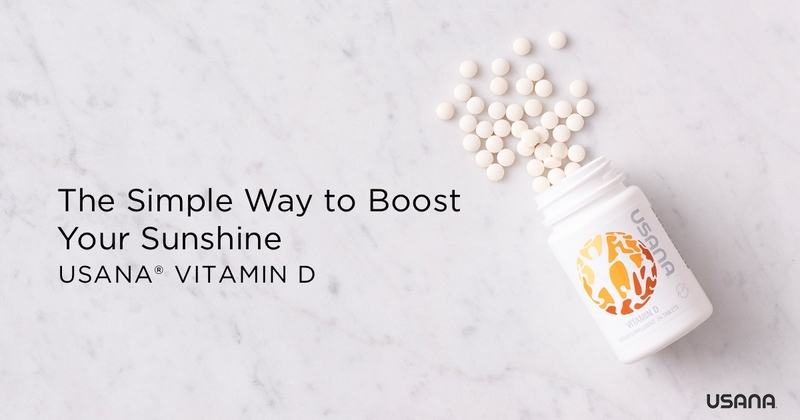 It feeds your soul and, quite literally, nourishes your body by helping it create vitamin D. But you have to be committed if you want to get all your vitamin D from the sun. First, make sure you live close enough to the equator during the prime time of year for optimal rays. Then spend at least 10 to 15 minutes outside every couple of days, between 10 am and 3 pm. Expose as much skin as possible. And don’t wear sunscreen but avoid a skin-damaging sunburn. If you spend a lot of time outdoors in the sun, you may not need additional vitamin D supplementation beyond your regular multivitamin on most days. But if, like most people, you aren’t getting the right kind of sunlight every day, try to spend more time in nature and make USANA Vitamin D your personal source of sunshine. 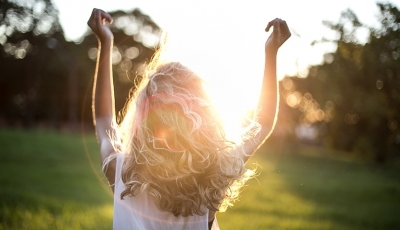 7 How Much Vitamin D Do You Need? Vitamin D status is a factor in the maintenance of good health. However, deficiency and insufficiency are all too common. Reports continue to show that nearly 50 percent of the worldwide population is suffering from too little vitamin D. In the U.S. alone, as many as two-thirds of people don’t get enough vitamin D every day. The problem is widespread and increasing. This could have potentially severe and far-reaching repercussions. Low vitamin D status has been linked to many different poor health outcomes in people across the globe. There are a number of factors that can contribute to insufficient levels of vitamin D.
Humans evolved outdoors, where we were constantly exposed to sunlight. 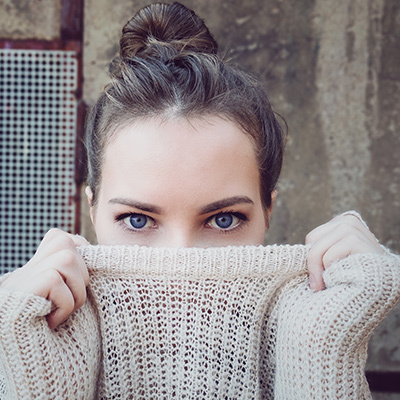 So, our bodies developed the ability to convert ultraviolet B (UVB) rays into a vital substance that acts like a vitamin and a hormone to support our health: vitamin D.
Unfortunately, the circumstances for UVB exposure aren’t too favorable in the modern world. People spend more and more time indoors. And fears of skin cancer and premature aging mean wearing sunscreen and covering up when outdoors. 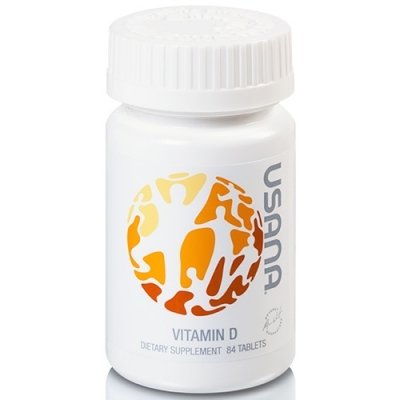 This has led to a significant decline in natural vitamin D levels due to a lack of UVB exposure. Take a look at a globe and find the equator. As you get further from it, your body will have a harder time using sunlight to make vitamin D. This is because sunlight is hitting the atmosphere at more of an angle, blocking out more UVB rays, especially during the winter season. 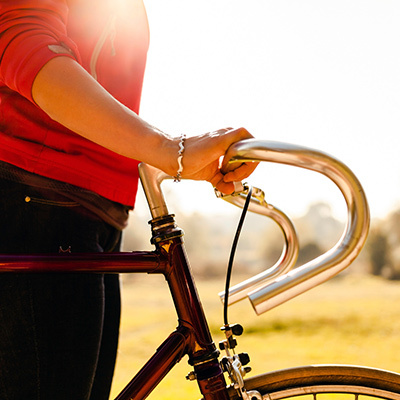 If you live in polluted areas, that can impact how much UVB gets through to your skin, too. During the fall and winter months, the sun’s angle is also a problem. This is because fewer UVB rays pass through the atmosphere during the early and later parts of the day. The closer to midday you are, the more UVB rays your body is getting. You can test this simply by looking at the length of your shadow when standing outside. If your shadow is longer than you are tall, fewer UVB rays are reaching your body, and you’re not producing as much vitamin D.
The fact that older people usually spend more time indoors due to lowered mobility, impacts vitamin D status. But aging correlates to vitamin D deficiency in a couple of other ways: First, the skin loses its ability to absorb as much vitamin D as you get older. And second, your kidneys slowly become less effective at converting vitamin D from the sun into the form used by your body. Those with darker skin are at a higher risk for vitamin D deficiency because skin pigment has a direct correlation with how much vitamin D is made by the body. 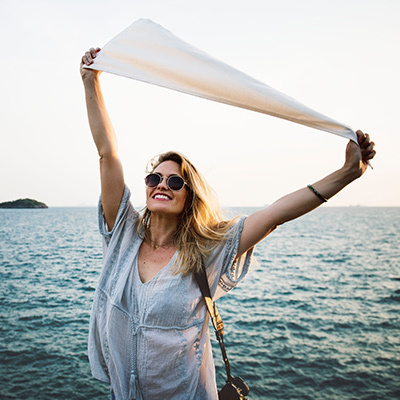 Some research suggests that those with darker skin may need up to 10 times more sun exposure than those with lighter skin to produce a comparable amount of vitamin D.
Vitamin D is fat-soluble—meaning that the fat in your body is how you collect and store it. So, if you’re overweight, the excessive amount of fat in your body needs a comparable amount of vitamin D to absorb. So, you’ll need a lot more vitamin D than someone with a lower percentage of body fat. Certain gut conditions that cause a lower absorption of fat can also lower your absorption of vitamin D.
You can add vitamin D to your daily diet with some foods. Fatty fish (salmon and trout), milk (dairy, almond, or soy), yogurt, egg yolks, fortified orange juice, and fortified cereals are sources of vitamin D. However, the amount in these foods is pretty low. Each tablet contains 30 mcg of vitamin K2 as menaquinone-4 (MK-4) and menaquinone-7 (MK-7). (“Menaquinone” plus the number is simply a way to describe subtypes of vitamin K molecules with slightly different structures.) 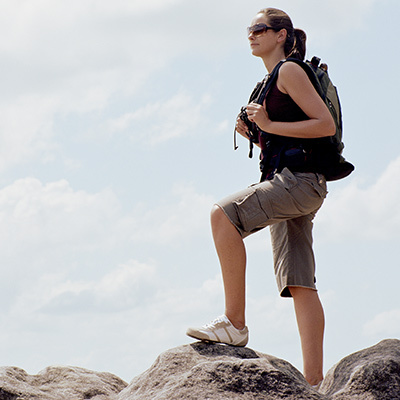 By providing both types of vitamin K2, you get benefits similar to those from a varied diet. The MK-4 form of vitamin K comes from animal sources, like butter, liver, and eggs. Your body also naturally synthesizes a small amount of MK-4 from vitamin K1 (which comes from green leafy vegetables). Vitamin D is unique because it goes through a couple different conversions in your body. First, 25(OH)D is made as a result of a reaction between the vitamin D3 from your skin or diet and enzymes in your liver. This form is considered a prohormone, which means it’s a precursor of a hormone that becomes active when it’s metabolized. Your body tightly controls the circulating levels of active vitamin D. But a supplement can help ensure ample 25(OH)D will be available for conversion into the active form when needed. And your body needs a lot. Because the active vitamin D hormones influence many biological activities by sending messages via receptor sites. Vitamin D has also been estimated to regulate somewhere between 200-300 genes. When you think healthy bones and teeth, you probably think calcium. It’s well known as the major building block of a strong skeleton. But other nutrients are equally important. 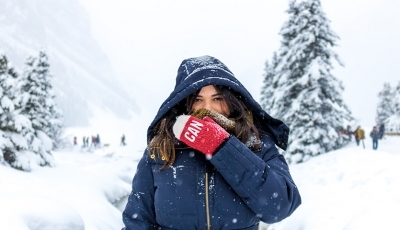 From long summer days to short wintry nights, your life never slows down. And neither does your immune system. 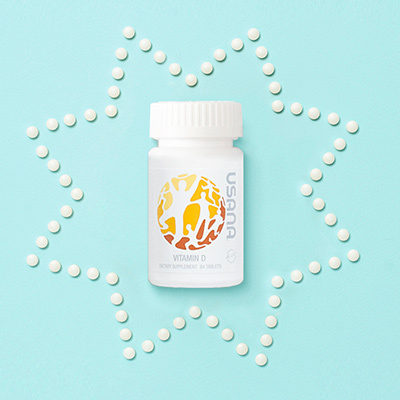 USANA Vitamin D can help keep you well, so you can keep up with your life—no matter the season. Turns out, when you run low on vitamin D, it takes a pretty serious toll on your mood. This is because your brain produces serotonin—a hormone that affects mood—at a higher rate when you’re exposed to sunshine or bright light. People who are unknowingly deficient in vitamin D might complain of low back pain. This could be related to weakened bones. Those with low levels of vitamin D may not absorb calcium and phosphorus efficiently, which, in turn, may impact bone mass. Muscle cramps, pain, or weakness; fatigue; and hair loss have also been attributed to low levels of vitamin D. If you’re experiencing any of the above symptoms, talk to your doctor and ask for a test to check your vitamin D levels. This is why USANA’s Vitamin D is designed to complement other USANA supplements, including the CellSentials, MagneCal D, and BiOmega. It’s an easy way to get 50 mcg (2,000 IU) of vitamin D3 per day. 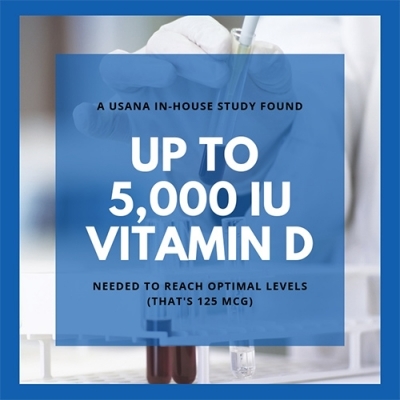 Taking a combination of these USANA products should be enough for most healthy adults to reach ideal levels and get the true health benefits of a vitamin D supplement. Take one (1) tablet daily, preferably with food. Keep out of reach of children. Consult your physician if you are pregnant, nursing, taking a prescription drug, or have a medical condition. If you exceed the established Upper Limit (UL) of 100 mcg (4,000 IU/d) for Vitamin D intake, regular blood tests for vitamin D and calcium status are recommended. Can I take more than one Vitamin D tablet per day? USANA can only recommend that you follow the suggested serving size and other applicable directions as they are listed on product labels. If you feel that you require higher amounts of vitamin D, please consult with your healthcare professional. Why does USANA’s Vitamin D contain a warning about blood tests? In addition to the standard dietary supplement warning, the warning about blood tests is a general warning added as a precaution. There has never been a clinically documented case of vitamin D toxicity below 30,000 IU. However, the official upper limit for vitamin D is currently set at 100 µg (4,000 IU) per day, and as a company we feel it is our duty to promote awareness and education among our customers. If someone has concern about safety, is regularly exposed to unusual levels of sunlight, or wants to be absolutely certain of their vitamin D blood levels, we suggest getting vitamin D levels checked before taking large supplemental levels of vitamin D.
Are there any drug interactions with vitamin D? Vitamin D supplements do have the potential to interact with certain types of medications (including steroids and cholesterol-lowering drugs). Those taking medications should discuss vitamin D supplementation with their healthcare providers prior to use. How do I convert micrograms to IU’s? Ginde A, Liu M, Camargo Jr. C. 2009. Demographic Differences and Trends of Vitamin D Insufficiency in the US Population, 1988-2004. Arch Intern Med. 169(6):626–632. Looker AC, et al. Serum 25-hydroxyvitamin D status of the US population: 1988- 1994 compared with 2000-2004. 2008. AJCN 88(6):1519-1527. Bodnar LM, Simhan HN, Powers RW, Frank MP, Cooperstein E, Roberts JM. High Prevalence of Vitamin D Insufficiency in Black and White Pregnant Women Residing in the Northern United States and Their Neonates. 2007. J Nutr 137:447-452. Nair R, Maseeh A. 2012. Vitamin D: The “sunshine” vitamin. J Pharmacol Pharmacother 3(2): 118-126. Sadat-Ali M, et al. 2018. Correlation of symptoms to serum vitamin D levels? Clin Nutr ESPEN 24: 31-34. Ju SY, Lee YJ, Jeong SN. 2013. Serum 25-hydroxyvitamin D levels and the risk of depression: a systematic review and meta-analysis. J Nutr Health Aging 17(5): 447-55. Erkal MZ, et al. 2006. High prevalence of vitamin D deficiency, secondary hyperparathyroidism and generalized bone pain in Turkish immigrants in Germany: identification of risk factors. Osteoporos Int 17(8): 1133-40. Oliveri B, et al. 2015. Vitamin D3 seems more appropriate than D2 to sustain adequate levels of 25OHD: a pharmacokinetic approach. Eur J Clin Nutr 69(6): 797-702. Tripkovic L, et al. 2012. Comparison of vitamin D2 and vitamin D3 supplementation in raising serum 25-hydroxyvitamin D status: a systematic review and meta-analysis. Am J Clin Nutr 95(6): 1357-1364. Shea MK, et al 2008. Vitamin K and Vitamin D Status: Associations with Inflammatory Markers in the Framingham Offspring Study. Am J Epidemiol 167(3): 313-20. Binkley N, et al. 2007. Low Vitamin D Status despite Abundant Sun Exposure. J Clin Endroclinol Metab 92(6): 2130-5. Norman A. 2008. From vitamin D to hormone D: fundamentals of the vitamin D endocrine system essential for good health. Am Jour Clin Nutr 88(2): 491S-499S. DeLuca HF. 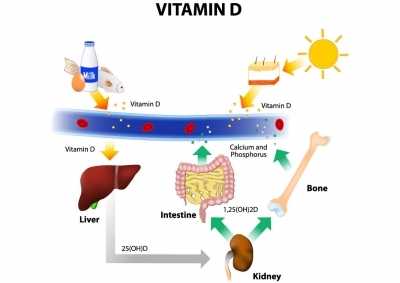 Overview of general physiologic features and functions of vitamin D. 2004. Am J Clin Nutr 80(6 Suppl):1689S-1696S. Holick MF, et al. 2011. Evaluation, Treatment, and Prevention of Vitamin D Deficiency: An Endocrine Society Clinical Practice Guideline. J Clin Endorcrinol 96(7): 1911-30. Bischoff-Ferrari HA, Willett WC, Wong JB, Giovannucci E, Dietrich T, Dawson-Hughes B. Fracture prevention with vitamin D supplementation: a meta-analysis of randomized controlled trials. 2005. JAMA 293(18):2257-2264. Feskanich D, Willett WC, Colditz GA. Calcium, vitamin D, milk consumption, and hip fractures: a prospective study among postmenopausal women. 2003. Am J Clin Nutr 77(2):504-511. Papadimitropoulos E, et al. Meta-analyses of therapies for postmenopausal osteoporosis. VIII: Meta-analysis of the efficacy of vitamin D treatment in preventing osteoporosis in postmenopausal women. 2002. Endocr Rev 23(4):560-9. Knapen MH, et al. 2013. 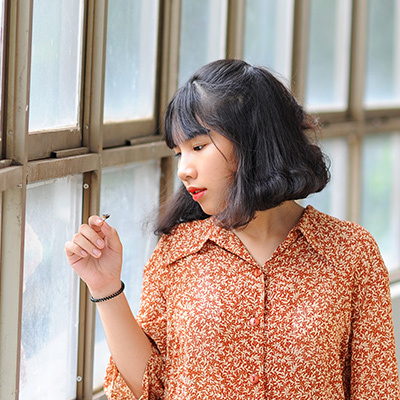 Three-year low-dose menaquinone-7 supplementation helps decrease bone loss in healthy postmenopausal women. Osteoporos Int 24(9): 2499-507. Bolton-Smith C, et al. 2007. Two-year randomized controlled trial of vitamin K1 (phylloquinone) and vitamin D3 plus calcium on the bone health of older women. J Bone Miner Res 22(4): 509-19. Palermo A, et al. 2017. 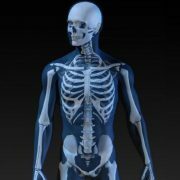 Vitamin K and osteoporosis: Myth or reality? Metabolism 70: 57-71. Janssen HC, Samson MM, Verhaar HJ. 2002. Vitamin D deficiency, muscle function, and falls in elderly people. Am J Clin Nutr 75(4): 611-5. Wimalawansa SJ. 2012. Vitamin D in the new millennium. Curr Osteoporos Rep 10(1): 4-15. Close GL, et al. 2013. Assessment of vitamin D concentration in non-supplemented professional athletes and healthy adults during the winter months in the UK: implications for skeletal muscle function. J Sports Sci 31(4): 344-53. Manoy P, et al. 2017. Vitamin D Supplementation Improves Quality of Life and Physical Performance in Osteoarthritis Patients. Nutrients 9(8): pii: E799. Apaydin M, et al. 2018. The effects of single high-dose or daily low-dosage oral colecalciferol [sic] treatment on vitamin D levels and muscle strength in postmenopausal women. BMC Endocr Disord 18(1): 48. Zhang FF, et al. 2014. Vitamin D Deficiency Is Associated with Progression of Knee Osteoarthritis. J Nutr 144(12): 2002-2008. Jamil NA, et al. 2017. The relationship between vitamin D status and muscle strength in young healthy adults from sunny climate countries currently living in the northeast of Scotland. Osteoporos Int 28(4): 1433-1443. Maresz K. 2015. Proper Calcium Use: Vitamin K2 as a Promoter of Bone and Cardiovascular Health. Integr Med (Encinitas). 14(1): 34-9. Barker T, et al. 2013. Higher serum 25-hydroxyvitamin D concentrations associate with a faster recovery of skeletal muscle strength after muscular injury. Nutrition & Metabolism 10: 1-10. Gröber U, Reichrath J, Holick MF, Kisters K. 2014. Vitamin K: an old vitamin in a new perspective. Dermatoendocrinol 6(1): e968490. Edfeldt K, et al. 2010. 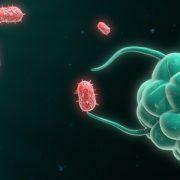 T-cell cytokines differentially control human monocyte antimicrobial responses by regulating vitamin D metabolism. Proc Natl Acad Sci U S A 107(52): 22593-8. Misra D, et al. 2013. Vitamin K Deficiency Is Associated with Incident Knee Osteoarthritis. Am J Med 126(3): 243-248. Shea MK, et al. 2015. The association between vitamin K status and knee osteoarthritis features in older adults: The Health, Aging and Body Composition Study. Osteoarthritis Cartilage 23(3): 370-378. Mostafa W, Hegazy R. 2015. Vitamin D and the skin: focus on a complex relationship: a review. J Adv Res 6(6): 793-804. Ghai B, et al. 2015. High prevalence of hypovitaminosis D in Indian chronic low back patients. Pain Physicial 18(5): E853-62. e Silva AV, et al. 2103. Association of back pain with hypovitaminosis D in postmenopausal women with low bone mass. BMC Musculoskelet Disord 14: 184. 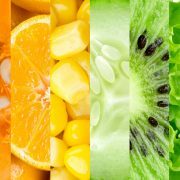 An introduction to the basics of vitamins and how they help your health. Discover more about the vitamins your body needs.